To Cite: Sedighi I, Zahirnia A H, Afkhami M. Buccal Cellulitis Caused by Cutaneous Miasis in an 11-month-old Infant, Arch Clin Infect Dis. 2013 ; 8(2):e16994. doi: 10.5812/archcid.16994. Introduction: Myiasis is a parasitic infestation of the body by fly larvae. The common hosts of this larva are the animals, but in some cases it can also affect the human, which is rarely reported in children and commonly found in tropical and developing countries. Case Presentation: This study, presents a case of cutaneous myiasis in an infant. A 11-month-old girl with popular lesion on buccal area, she does not response to the initial anti-bacterial therapies and progress the buccal cellulitis. 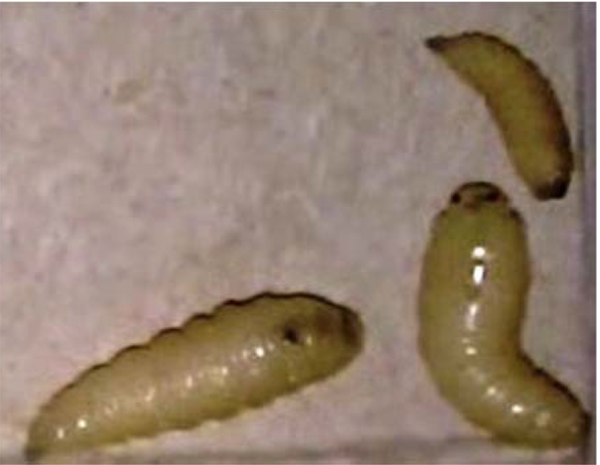 Retrieval of three larvae from the lesion led to definitive diagnosis of Calliphora vicina (Diptera: Calliphoridae) larvae infestation and treatment by occlusive ointment, resulted in complete cure. Conclusions: The myiasis is an uncommon disease in Iran and physicians should be aware of this disease, especially if there are non-healing lesions on exposed skin and worm-like protruding lesion. Myiasis is a pathogenic condition found in live human and animals caused by various species of dipteran larvae (1). The most common host of myiasis is the livestock and human, myiasis is a rare condition and usually classified according to the entomological or clinical features. Entomologically, flies may be classified in to three myiasis-producing groups: obligatory, facultative, and accidental. Clinically, myiasis can be classified based on the affected part of the body. Skin involvement is the most frequently reported clinical manifestation, but myiasis of oral, ocular, nasal, gastrointestinal and genitourinary sites have also been described (2). Myiasis occurs worldwide, but more often in tropical and sub-tropical climates (3). In Iran, many cases of human myiasis have been reported. The first case was reported by Minar when he recovered Oestrus ovis larvae from the eye of an Iranian woman in Tehran (4). Myiasis has been reported several times as ophthalmyiasis (5), urogenital myiasis (6), orbit myiasis (7), pharyngeal myiasis (8), ear myiasis (9), oral mucosa myiasis (10), wound myiasis (11) and auricular myiasis (12-14). The main contributing factors include higher level of exposure to flies, poorer clothing and poor hygienic conditions, combined with the increased aggressiveness of myiasis-causing flies in the tropical area (15). 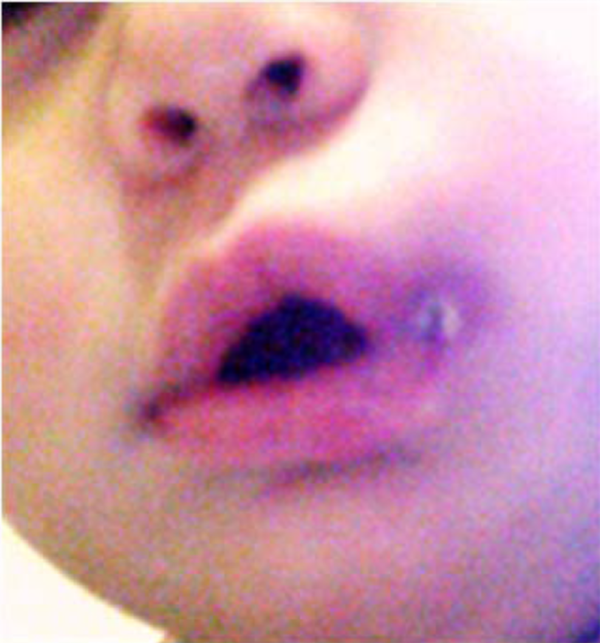 In this report, we introduce an infant with cutaneous myiasis, which caused buccal cellulitis. A healthy 11-month-old girl was referred to Besat General Hospital, in Hamadan city with buccal swelling and erythema, which has been appeared three days before (Figure 1). Her mother complained of movements inside the affected area and egress of worm-like organisms from the whole affected area. Physical examinations showed a single nodule were indurated erythematous (diameter 1.5 cm) and a central pore (diameter 3 mm) containing three moving larvae. Except low grade fever (38.4 °C), she did not have any other systemic symptoms. After applying the occlusive ointment, the larvae moved out next day without any intervention. The larvae were 13*50 mm, 80*20 mm and 50*10 mm in size (Figure 2). Two of the dead larvae were in third and fourth stages and were sent to the medical entomology department for further identification. For a better visualization two larvae were put in 10% KOH solution for 24 hours and then the key morphological characters including the size of the larvae, position of posterior spiracles and posterior cavity as mentioned by Zumpt (1) were examined under microscope (Zeiss upright microscope Axio Lab. A1). The cephalo-pharyngeal skeleton and both anterior and posterior spiracle dissected and mounted on glass slide by Pouri solution (Figure 3). A) Posterior Spiracle; B) Cephalopharengial Skeleton. After desiccation the larva was keyed using valid characteristic keys (1, 16, 17). The morphological features of the larvae were characterized as Calliphora vicina Robineau-Desvoidy 1830 (Diptera: Calliphoridae) (18-20). Since both larvae were dead, identification was done according to the larvae characters and results were reported to the hospital. The final diagnosis was cutaneous myiasis. She had been visited by three physicians before referring to our hospital, but this diagnose was different with their differential diagnosis. After removing the larvae using an occlusive ointment, buccal cellulitis was treated with systemic antibiotic and the patient fully recovered within a few days. Calliphora vicina (Calliphoridae) known as the bluebottle flies, due to its metallic blue-gray color of thorax and abdomen is a cosmopolitan species in 13- 24 °C (55 - 75 °F) urban and natural environments, mainly in spring and fall. In Iran, this species has been reported from Tehran and the suburb (20). This fly is usually closely associated with man. Human myiasis usually occurs accidentally in neglected wounds and suppurating or necrotic tissues and it has a lower threshold temperature for flight activity compared to the other blowflies, which allows a greater prevalence during colder periods. Climatic factors such as temperature are also known to influence the egg laying and development of instar larvae. In warmer climate, the lifecycle span is shorter, and in cooler temperatures the lifecycle is longer (20). The initial misdiagnosis and delayed appropriate treatment caused unnecessary distress for the patients. Accurate diagnosis of cutaneous myiasis requires knowledge about the disease, patients’ exposure history and clinical suspicion. Main feature for cutaneous myiasis includes one or more non healing lesions on exposed skin and a few mm to 2 cm erythema; some serous, serosanguineaus or seropurulant drainage from a central pore. Local symptoms including pain, tenderness, purities or movement inside the lesion are so important. Sometimes worm-like protruding lesions are observed when pressed laterally. Definitive diagnosis is achieved after extraction and identification of the fly larvae. The myiasis is an uncommon disease in our country, whose diagnosis requires awareness and high clinical suspicion. Hence, it is important to know that the etiology of this disease is not eradicated and general physician, pediatrician and dermatologists should have knowledge about this very rare condition in children. We acknowledge Miss Narges Emami and the nurses in pediatric ward, who coordinated different parts of the study. Implication for health policy/practice/research/medical education: The myiasis is a rare disease, which its diagnosis requires awareness and high clinical suspicion but physicians should have knowledge about this condition in children.